The spatial distribution of exotics across riparian landscapes is not uniform, and research elaborating the environmental constraints and dispersal behavior that underlie these patterns of distribution is warranted. This study examined the spatial distribution, growth patterns, and habitat constraints of populations of the invasive Dioscorea oppositifolia in a forested stream corridor of a tributary of Drury Creek in Giant City State Park, IL. The distribution of D. oppositifolia was determined at the watershed scale mainly by floodplain structure and connectivity. Populations of D. oppositifolia were confined to the floodplain, with overbank flooding from the stream. Dioscorea oppositifolia probably originates in disturbed areas upstream of natural corridors, and subsequently, the species disperses downstream into pristine canyons or ravines via bulbils dispersing in the water. In Giant City State Park, populations of D. oppositifolia were distributed on the floodplain across broad gradients of soil texture, light, slope, and potential radiation. 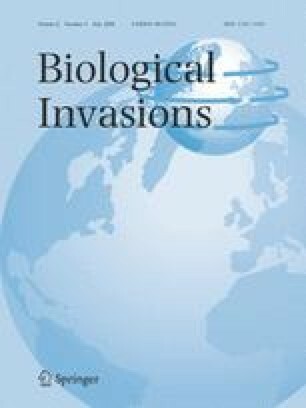 The study also examined the longevity of bulbils in various micro-environments to illuminate strategies for the management of the species in invaded watersheds. After 1 year, the highest percentages of bulbils were viable under leaves, and much lower percentages were viable over leaves, in soil, and in the creek (76.0±6.8, 21.2±9.6, 21.6±3.6, and 5.2±5.2%), respectively. This study suggests that management procedures that reduce leaf litter on the forest floor (e.g., prescribed burning) could reduce the number of bulbils of D. oppositifolia stored in the watershed.